On Friday, December 2nd, NBC will be airing another Family Movie Night movie at 8/7c. 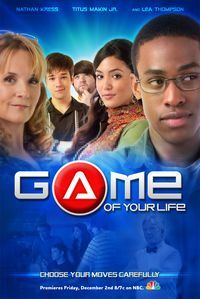 I got a chance to preview Game of Your Life, and once again, Family Movie Night offers a wholesome movie that I feel comfortable with my entire family watching. The movie starts off a little slow, but after about 10-15 minutes the pace picks up. This movie offers plenty of opportunities for discussion with your children about many things - making good choices, especially how the choices you make affect not only you but those around you also; having loyalty; keeping one's commitments; and making family important. This is a great movie for older children, pre-teens, and teens. To find out more, visit the Family Movie Night website, find them on Facebook, or follow them on Twitter. You can also watch a trailer.